Triglycerides are fats that occur in foods and your body. After you eat, your triglyceride levels are likely high, because your body stores food consumed as triglycerides, to use for energy later. If you consume more food than your body requires, the triglycerides accumulate, increasing your risk for high triglycerides and related conditions, such as heart attack, stroke and heart disease. A healthy diet, limited in particular foods, and regular exercise, can help reduce these risks. Added sugars add sweet flavor and calories, but few nutritional benefits, to foods. According to a report published in "Arteriosclerosis, Thrombosis, and Vascular Biology" in December 2005, high-fructose corn syrup has become the most common sweetener in commercial foods and may hold a significant role in obesity, overeating, reduced calorie expenditure and high triglyceride levels. Foods and beverages containing HFCS taste sweeter, which may lead to increased appetite. Your body also regulates fructose sweeteners less effectively than other carbohydrate forms, which may also boost your triglycerides. Common sources of HFCS include regular soft drinks, breakfast cereals, granola bars, candy bars, ketchup, lunch meats and crackers. Hydrogenated vegetable oil is a solid fat form, created by adding hydrogen to vegetable oil. Prevalent in margarine, shortening and commercially prepared crackers, cookies, pastries, pie crust and frozen entrees, hydrogenated vegetable oil is a prime source of trans fatty acids, or trans fats. Trans fats can increase your low-density lipoprotein, or "bad," cholesterol, decrease your high-density lipoprotein, or "good," cholesterol and increase your risk for high triglycerides. Because commercial foods are not required by law to list trans fat content lower than 0.5 gram per serving, and can display a "trans-fat free" label, check ingredient lists on food packaging to determine whether trans fats are present. Enriched flour derives from a whole grain. During food processing, much of the nutrient content of the grain is removed. As a result, enriched flour products digest less efficiently and provide less fiber and fewer nutrients than whole grains. Refined grains can also increase your triglyceride levels. To prevent this, avoid enriched breads, pasta, cereals and snack foods that list enriched flour as a main ingredient. For added benefits, replace enriched foods with whole grains, such as oats, barley and brown rice, which promote cardiovascular health. Meat and dairy products supply valuable amounts of protein and micronutrients, such as B vitamins and iron. High-fat varieties, however, are rich in saturated fat -- a fat form linked to obesity, metabolic syndrome and high triglyceride levels. 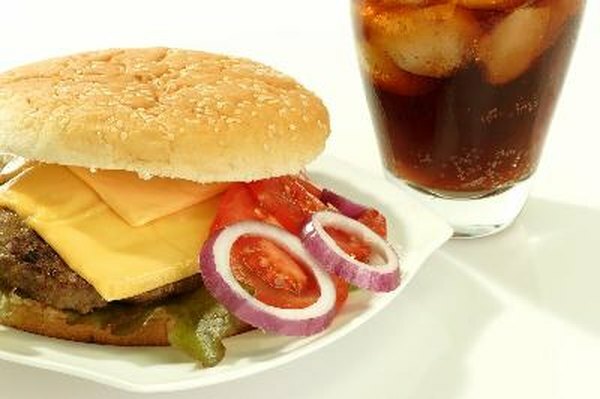 High-fat fast food items may pose marked risks, according to the "Arteriosclerosis, Thrombosis, and Vascular Biology" report. Choose leaner protein sources, such as fish, skinless white-meat poultry and low-fat milk and yogurt, over organ meats, hamburgers, fried chicken, bacon, sausage, whole milk, butter and cheese most often.